So I hear you guys like big feedback posts. So I decided to give you one or two. After playing this game for over a hundred hours because oh god why, I figured I'd throw some thoughts out there and see what everyone thinks, and maybe give the devs some new perspectives. I want to start this off by saying that my favorite sovereign right now is probably the Tyrant, mostly because of a unified theme. Most of the sovereigns are focused on one particular aspect of the game, but few of them have real flavor that pervades all aspects of the game. Most of them only have one unique unit, for example. The Tyrant, meanwhile, has six unique units, a node that gives specially themed items in his tree, and just generally keeps to his "dark" theme all the way through in a way that few other sovereigns do. There were some concerns on the Steam forum about only playing one race and all that. I think part of the problem is that many of the sovereigns end up feeling too similar to one another. In many cases that's just perception, but a few more unique units and a few choice special crafting recipes for each sovereign would go a long way in making them feel distinct. This doesn't mean much in the grand scheme of things since you can customize sovereigns, but the default champs for some of the sovereigns confuse me on a design level, since they feel like they'd fit in better with a different one. Keplin's focus on magic fits in thematically much better with the Wizard, and Shadowbolt has great synergy with Hypnotism. Tandis' focus on raw might and combat fits in thematically with the Commander, and his group buffs work well with the Commander's huge army size. Varda's "holy" and vaguely paladin theme fits well with the Priestess, and her focus on soloing works well with the sovereign's small max army size. The Wizard currently is tied with the Tyrant for having the second largest max army size of all the sovereigns. This feels...weird, to say the least, and actually kind of undermines his central theme. Hypnotism is already on the devs' radar according to some of the streams, so I won't harp on it. Making units it gets you cost logistics or mana per turn makes sense. I really dislike the Commander's various Guild upgrades, because it leads too much to units getting made obsolete. Granted, this is also the case with certain Enchantment spells, but it really bothers me due to SK's more RPG focus, so obsoleting units you made and potentially grew attached to seems...wrong, somehow. Some way to retrofit units with these kinds of buffs would be welcome. I don't think I've ever used Chant of Vitality, ever. It's really not worth the mana cost. Drain Shard is a problematic ability. On the surface, it yields a good "immediate mana vs. magic over time" choice. However, there are two main problems with it. The first being that even for the Tyrant, having high doomsday is generally bad, and the second being that shards are important to keep for the scaling of spells. Another issue is that mana isn't even a problem for the Tyrant anyway, since Siphon gives you loads of the stuff without you having to blow up precious shards. I'd suggest one of two possible ways to fix this: first option would be to switch the functionality of it and Consume so that the Tyrant gets the exclusive ability to blow up shards outside of his own area of control. This would then be much more useful as a last ditch effort to get some benefit from a shard you can't defend, or to get some use out of shards on allied rival territory. The other possibility is to have a unique Tyrant ability where his skills scale with both shards owned AND shards destroyed, so his spells will continue to scale upward. It'd fit in well with the Tyrant's "scale with the SK" theme. I know it's not Tyrant-specific, but it affects the Tyrant the most because he gets it from Dark Forging: can we get a buff to the Hellfire Staff? It takes significantly more resources for a weapon that's worse than the Hailstone and Leht Staves due to that awful initiative penalty. Can the earthen familiar get a movement speed boost? It'd be useful for early armies if it didn't slow down your entire stack, and late-game you'll have better options since the thing is so fragile. The Priestess has the smallest max army size, and I don't know why. She ends up sacrificing a lot of stuff in general for her gimmick, which is so gimmicky that I pretty much don't use destiny's favor except to Heavenly Ward trained units I plan on using in my final stack. Her default spells are awesome, granted. Divine Wisdom is rather expensive for a random +1 that you can't even stack. It's effect feels really weak compared to abilities like Hypnotism and Coercion. His sovereign tree could use some rearranging, in my opinion. When you already start with an enchantment slot, making getting a -second- enchantment slot as his first skill pick to get to the rest of his tree is a bit excessive. He needs a lot of other things than even more enchantment slots early-game, such as easier access to loot or the like. He has a total of +5 army slots on his tree, spread out over four skill nodes. Effectively, he has to pay twice the skill picks to get less slots than the Commander, Wizard, or Tyrant, and to be on par with the Guardian. Clairvoyance Amulets get filed away in the "never crafted" file for me. Radiant Diamonds are rare as-is, and they're used in the various legendary weapon and armor recipes. There's no way I'm going to spend one in order to trade an accessory slot for another sovereign spell cast. Priestess starting spells are really good, but her skill tree isn't as good as the other classes. However, divine vision is good for occasionally reducing doomsday. Shard healing is good when it's good. Ultimately, she's not necessarily a better healer than the wizard, but early game she is the best healer. I agree the default champions are confusing, but they actually have some synergies with their default sovereign. For example, in the case of Tandis, the wizard's movement and mentoring skill upgrades go well with him. Additionally, some spells are excellent for a solo warrior champion. While Keplin is more like the wizard, he would make Galor more challenging for me to play in the beginning, since Galor doesn't come with zero cost spells to spam with. Tandis at least cut down on mana costs in the early game. I find Tandis's acrobat ability incredibly useful for keeping him alive against Fallen apprentices even on insane, something that Keplin's invulnerability does not protect against. Tandis is also better for trash mobs, saving mana for the big and decisive battles. Tandis fits better with the Relias image seeing how Galor is the son of Relias, although Tandis actually comes from Tarth. Perhaps Galor feels sorry for him. In any case, I see this a lot like how Merlin is King Arthur's mentor and protector rather than an apprenticeship of magic. Also reminds me of Ganadalf. Galor is basically the white wizard stereotype. Currently, I struggle the most with the Tinkerer, unless I go for a super army with killer enchantments. Commander is the easiest for me to play. This is thanks to the hidden bonus of three additional armies plus immediately upgrading to leadership I. The huge 25% xp bonus per shard is outrageous overpowered in my opinion, even on few shards option. The commander is both front-loaded and end-loaded. In other words, he has strong skills throughout the skill tree. Tyrant could use a (expensive?) skill to increase how much doom you can have before game over. Just cut off the bonuses at the 500 doom limit, 450 or 400 if overpowered. If sovereigns feel too similar it cause many of the skill upgrades are stat upgrades rather than provide new game play mechanics or new units like you said. They feel different enough for me, but I understand the concern. I always go for the sentinel unit as part of my rush or early development strategy. There're a lot more to go into but these are what come to mind at the moment. Thank you both for providing such comprehensive feedback! I've gone ahead and forwarded your feedback to the development team. I just noticed Priestess's holy vindication encourages you to use the largest army possible yet like Grakor said, the priestess has the smallest army size. I got some uses out of holy vindication during early game on insane mode. It certainly not as a good of spell on insane mode, because enemies have a lot health points. It's more useful on normal and easy difficult. Into the light is good for free mana in easy battles when you can damage enemies enough so into the light will deliver the killing blow. Kelpin's more casting per battle helps here. In the case of taking wizard's superior clairvoyance upgrades early on, raise skeleton is very useful for the 1 mana cost. In general, some skill upgrades are clearly better than other. Who takes the indoctrinate skill for Krognar the tyrant for +1 favor for all minor races? It would be better if it give you a second chance to ally with races lost to Sorcerer King but that's too good. 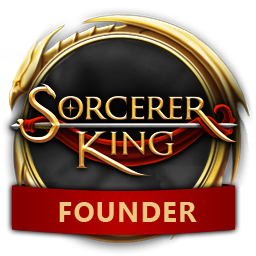 I rather have -1 to Sorcerer King's favor on the minor races. good post Grakor. i especially agree with this bit.. Most of the sovereigns are focused on one particular aspect of the game, but few of them have real flavor that pervades all aspects of the game. Most of them only have one unique unit, for example. The Tyrant, meanwhile, has six unique units, a node that gives specially themed items in his tree, and just generally keeps to his "dark" theme all the way through in a way that few other sovereigns do. and the priestess tree DEFINITELY needs some love. And the tinkerer doesn't get the bonus crafting components when he takes certain skills. And yeah, the priestess tree could really use something...more. Her tree feels very...empty and void of anything exciting after you grab your hero and the ability to regen shards. The bottom tree is fine I think, though I feel like tying Destiny's Favor to her skill tree was a mistake. Also, Commander exp-per-shard bonuses are indeed crazy OP, though I'll miss them if they get nerfed. It's a way to max out champs on smaller maps. Completely agree with the obsolete issue. The problem I have with the Commander, and SK in general is that you get too many meatbags from quest that you discard to city storage once a better meatbag can take their place in your active stacks. Another issue is how SK simply recycle the resources from FE. In this particular case, it is the unit size (# of people making up a unit). The fired swimming instructor is only a single person unit, trained units have 3 people, and the rare units you find have 4. Their scaling is completely different and has huge impact on their stats and usefulness later on. Rather then giving us these randomly named meatbags with customized stats, can we get them as volunteers (you can them re-purpose them as soldiers) or scholars (can re-purpose them as admin, logistic support, etc.) For volunteers, if you don't want them to be so generic, then give each of them a random +1 bonus stat (e.g. +1 heal, +1 crit, +2 def, +2 atk). The player can use these volunteers to form their own unit (by combining up to 4 volunteers, or 6 for commander into 1 unit, just like how army size work in FE). The individual volunteer's bonus would then be added as a unit bonus. You would then make use of the crafting system to craft the require gears to start them off (e.g. bows for archers). The 2nd issue is trained troops from city with high essence count, and assuming you have all 3 aura spells, their stats would quite surpass everything else. The fix for this would be to have the unit you formed to go to these cities to acquire a (permanent) training buff, broken down by tier to help augment the stats. This should address the obsolete issue, and the training tier scales based on your leader's progression. Don't know how difficult it would be to make this level of change, so might need to shelf this for SK2. Adding to the woe is a basic RPG issue of drops - or not getting the mats you need. Mobs are randomized based on lair location, so you don't really have a farming spot to farm them like in a real RPG. Enchant system is so horrible, you might want to take a page from WoW's gem crafting system (namely the colour coding so people are force to add a variety of items to the slots, instead of stuffing only platinum ore on all 4 slots) and rework the gear enchant. That enchant UI is total failure... When you enchant something, the item move to the bottom of the character's list while your cursor stay at the top... which prevents you to enchant all 4 slots at once, easy to put the wrong item in a different equipment's enchant slot. The current way of listing all units with equipment in the enchant tab, and the user/item/cursor issue... it is about as functional as a BSOD. Streamline example: make the enchant system less mat dependent... translate any tier 1 material (e.g. stuff in transmute I) into a generic substance that you can create substance A (let's call this Tier 1 Essence). You can then use X # of essence to apply an enchant. Repeat for tier 2 and 3... with the exception that tier 2 & 3 enchants also make use of lower tier Essence (instead of having these sit in inventory, to be sold for mana). Dev should take some time and research how other games does crafting and enchant... or play some MMORPG themselves. Current iteration of crafting and enchant is not just unpolished, but totally amateurish & laziness with recycled resources from FE. Fire Emblem: Awakening - Fire Emblem is all about recruiting your army. Notice how they cut the inventory per character to just 5 slots, for only weapons and consumable, to help make equipment and inventory manageable and not a full time job. It also organize the weapons neatly into the weapon type, and grey out the ones that are being used. Sometimes, less is more. Perhaps we can reduce the equipment slot to 4 for SK, 1 weapon and 2-3 armor or accessories slots (let's assume the commander player will have 3 army stacks, or 45 units... you will still have 135 pieces of equipment to manage). Lastly, add in options to un-equip all, and gives generic troops default equipment if nothing is provided for them. Bravely Default: I would also like to focus your attention here on the story telling and character focus. The current champion amounts to a most used unit because they are powerful. If we want to implement RPG element into 4X, I would like to see more character and depth into the champions. I just replied to your post over on the steam forum (literally) and figured I would point you to my mod's I've made which fix at least some of the tinkerer issues. I'm working on redoing the entire recipe and loot soon to have it make more sense, but it's a pain! I agree with a lot of what you've said concerning enchantment. I know from someone whose trying to help out by modding stuff on my own, it's a pain because the files are bloated with stuff that's not used. Specifically on your comment about converting "Tier 1" materials into better materials, that is a fantastic idea. Got 20 cloudy diamonds, convert them to maybe 4 Radiant Diamonds. I'll include that in my to-do list. @Devs: there are better way to gate gear progression than simply make mats unavailable. For example, give each unit an equipment point allocation that increase with level. At level 2, unit now have 11 EP. They can now equip a leather hat that costs an addition 2 pts. Alternatively at level 1, unit equip a plate armor that costs 8 pt, and gloves that cost 2 pts. Clean up inventory/old resource list and add min. level requirement. Players generally want to give their unit best equipment ASAP, so make them available sooner rather than later, and be more creative on how they can earn it. The EP system is easier to calculate/manage than the old weight/encumbrance system. Could also, instead of tying enchants to materials, leave materials for the items themselves, and tie enchants to spellbooks. Because right now, I've found that the best way to handle Tinker or Commander is to customize them to /8/ enchantment books, and no others. So instead, say you want to be able to put +2 physical damage in a slot. Well, that's the kind of thing that sounds like bigger muscles, so we're looking at the Enchantment school. But you want +5 lightning (like an Onyx Ring does)? Well, that's obviously Wrath. Healing effects, and mana-gain? Well, all the specialists for that in previous Elemental games are Summoners, and in D&D you use Conjuration to draw the energy from a god to heal with, so it fits that Summoning would be needed for regeneration effects. Yet Chaos is where the weird, nasty stuff shows up, so that's where you'd probabably get the 'on kill' effects from. And if you want Flame Wave on Death, you may need Chaos 4, Wrath 4, completely cutting you off from a host of other kinds of enchantments. So you'd have 'Wrath I' books, kinda like now, but it wouldn't just be 1 use, it'd be limited only by your mana supplies. The Tinkerer would have advantages in being able to easily get the recipies and mats to make any base item he wants. Wizard would have advantages with mana availabilty to use to enchant items, though the tinker could still push them farther once he had the juice available (or enough mana pots). And let each sov have an enchant type all their own. Like the Priestess, no matter her books, could always apply +1 tactical regen, as a divine blessing upon the item. Tyrant could always apply +1 mana on killshot. Tinker could further his crafting advantage with a 1 random crafting mat on killshot. Guardian could grant +1 defense as an option. Commander could always have +1 move available. Wizard could always have +1 elemental damage. That way, no matter what spellbooks, they always have thematic enchantments available to them once they can enchant.